May Arts has a variety of ribbon with decorative accents such as scalloped, picot or a looped trim. 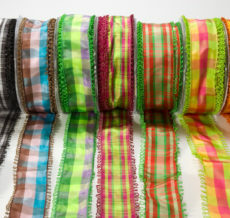 These ribbons are available in a wide variety of styles and widths. They are perfect for adding a delicate touch to sewing projects, gift wrapping, handmade cards, scrapbook pages and other craft projects.